The ColorQ photometer is optically more sensitive and accurate, than a visual test kit or test strips. 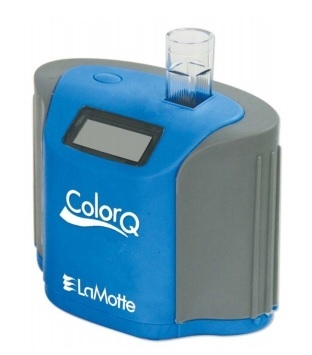 Following are a few things to consider, when using your ColorQ Tester. 2.) ● Always wipe the test vial before inserting into the meter to remove any moisture, fingerprints and/or dirt from the test vial. ● Only use test vial #0201; other vials may fit, but they are not optical grade. If scratched or stained, replace. ● Make sure the black printed arrow on the test vial is facing you and facing the display when you insert it into the meter. ● When the meter is turned on and says BLa; a vial of pool water needs to be in the meter. When you press the button and the dashes are going up & down, the meter is setting the baseline value for that water on that series of tests. ● Hold the bottle of reagent vertically over the test vial and let the drop fall freely into the vial. Holding the bottle on an angle will produce the wrong size drop and give incorrect results. Also, use only the reagent numbers that are in the blue section of the instructions. ● Make sure the test vials are free of stains, scratches, and discoloration; clean or replace as needed. After testing, empty vial and clean with the brush and fresh water. Tubes should be air dried between usage. ● Periodically clean the light chamber. Moisten the Q-tip with a window cleaner and gently swab out the square opening. Allow to dry about 20 minutes before using. This can help eliminate an ERR 7 message. ● If problems continue call 800 344-3100 and press 2, at the prompt. This will connect you with LaMotte Tech Support.